Fold tips of chicken wings under opposite ends to form triangles. Place remaining ingredients except sour cream in heavy-duty resealable plastic food-storage bag. Seal bag and shake to blend seasonings. Add chicken. Seal bag and shake until chicken is coated with seasonings. Refrigerate at least 30 minutes but no longer than 24 hours. Remove chicken from bag. Cover and grill chicken 4 to 6 inches from medium heat 20 to 25 minutes, turning after 10 minutes, until juice of chicken is no longer pink when centres of thickest pieces are cut. Serve with sour cream. 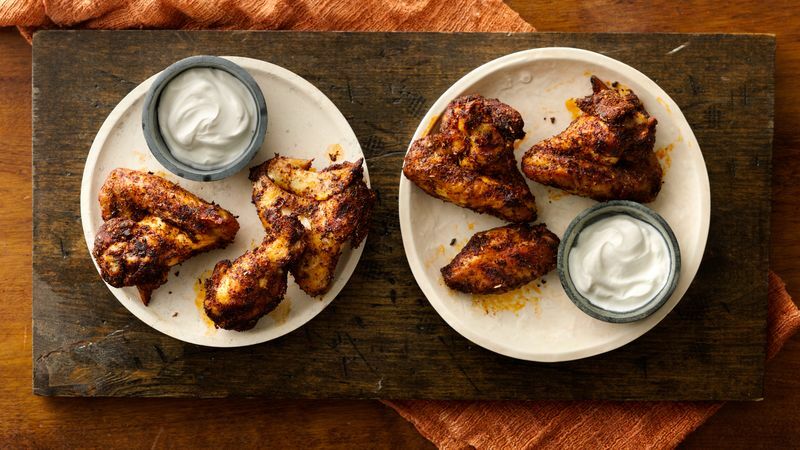 Serve With These flavourful chicken wings make a terrific appetizer for a summer barbecue. Time Saver Cool! You can grill the wings ahead of time. Just refrigerate and serve cold.